FRAMINGHAM, Mass., October 5, 2017 – According to the International Data Corporation (IDC) Worldwide Quarterly Cloud IT Infrastructure Tracker, vendor revenue from sales of infrastructure products (server, storage, and Ethernet switch) for cloud IT, including public and private cloud, grew 25.8% year over year in the second quarter of 2017 (2Q17), reaching $12.3 billion. Public Cloud infrastructure revenue grew 34.1% year over year and now represents 33.5% of total worldwide IT infrastructure spending at $8.7 billion, up from a 27.0% share one year ago. Private Cloud revenue reached $3.7 billion for an annual increase of 9.9%. Total worldwide cloud IT infrastructure revenue has almost tripled in the last four years, while the traditional (non-cloud) IT infrastructure revenue continues to decline and is down 3.8% from a year ago, although it still represents 52.4% of the worldwide share of overall IT revenue at $13.6 billion for the quarter. Public Cloud now represents 70.2% of the total cloud IT infrastructure revenue. The market with the highest growth in the public cloud infrastructure space was Enterprise Storage Systems with revenue up 30.4% compared to the same quarter of the previous year, and making up over a third of the revenue in public cloud. Server and Ethernet Switch public cloud IT infrastructure revenues were up 24.6% and 26.8% respectively. Private cloud infrastructure spending continues to be driven by the server market, which has remained nearly 60% of the revenue in that space for the past 18 quarters. "The strength in public cloud growth continued at an accelerated pace through the first half of 2017," said Kuba Stolarski, research director for Computing Platforms at IDC. "We have already reported that most of this growth is being driven by Amazon. However, it is important to remember that many of the other hyperscalers – Google, Facebook, Microsoft, Apple, Alibaba, Tencent, and Baidu – are preparing for their own expansions and Skylake/Purley refreshes of their infrastructure. At the same time, IDC is still seeing steady growth in the lower tiers of public cloud, and continued growth in private cloud on a worldwide scale. In combination, these infrastructure growth segments should more than offset the declines in traditional deployments for the remainder of 2017 and well into next year." Except for Latin America revenue that declined 13.1% from a year ago, all other regions in the world experienced double-digit revenue growth in the Cloud IT Infrastructure space compared to last year. Asia/Pacific (excluding Japan) and Western Europe led growth with rates of 30.5% and 33.4%, respectively. Canada (25.1%), Middle East & Africa (28.4%) and the United States (24.8%) had annual growth in the mid-twenties, while Central and Eastern Europe (16.9%) and Japan (10.4%) growth was below 20% but still double digit. 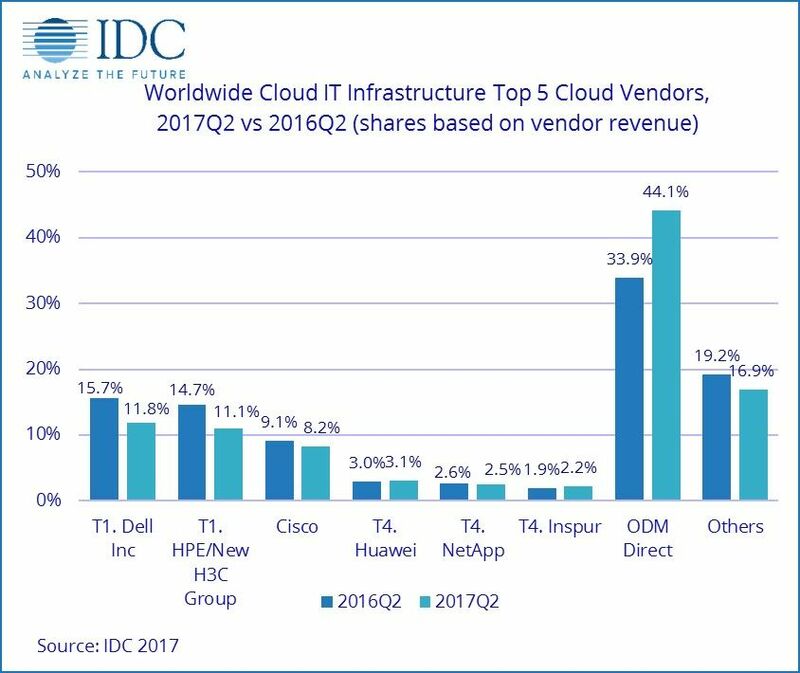 ***** IDC declares a statistical tie in the worldwide cloud IT infrastructure market when there is a difference of one percent or less in the vendor revenue shares among two or more vendors. ****** Due to the existing joint venture between HPE and the New H3C Group, IDC will be reporting external market share on a global level for HPE as "HPE/New H3C Group" starting from Q2 2016 and going forward. IDC's Worldwide Quarterly Cloud IT Infrastructure Tracker is designed to provide clients with a better understanding of what portion of the server, disk storage systems, and networking hardware markets are being deployed in cloud environments. This tracker will break out vendors' revenue by the hardware technology market into public and private cloud environments for historical data and provide a five-year forecast by the technology market.